The main features of DK-9521 is exactly the same as like the DK-9522 except that the 1 Amp relay of Output 2 is replaced by an NPN transistor in open collector for auxiliary control purposes. 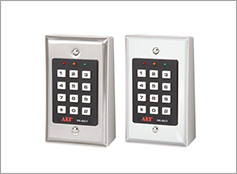 It is an ideal keypad for those installations requiring electric door strike and having full feature door protection monitoring. A slim-line surface mount box in Beige color is supplied with each keypad. The box in Black color is also available on request when place order. The DK-9521 is available in Back-lit keyboard or in Standard keyboard. The order number for Back-lit version is DK-9521BL, for Standard version is DK-9521. * Door Auto Re-lock after Valid Access Prevents "Tailgate Entry"